Guide in 'General Information' published by GeekMatt, Jul 9, 2015. Doing your Main Scenario Quests in Heavensward, you'll quickly come across the level 50 quest Divine Intervention issued by the NPC House Fortemps Steward--the rewards for which are a Black Chocobo and a Compass. 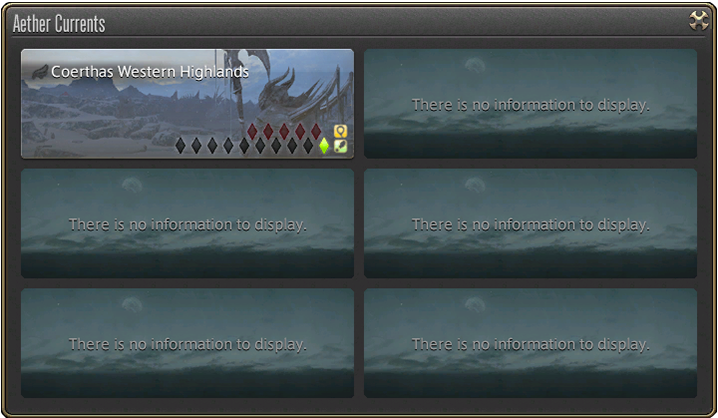 In order to begin flying on your Black Chocobo you'll need to locate and attune to all Aether Currents on the map. The above is to locate the Aether Currents spread through out each zone, but there's another type that you'll need which comes from quests. When doing Main Scenario as well as side quests from random NPCs you'll find some which offer Aether Currents as rewards. Simply complete the quest and the Current is yours. However, keep in mind some of these quests are buried behind other quests that need completing first--below you'll find a list of Quests offering Currents as rewards, as well as their prerequisite quests. 5 of these quests will exist in each zone. This includes your other chocobos, such as the one gained through your GC, your Fat Chocobo, and Legacy Chocobo. (Credit goes to GetIgnited on Reddit) or scroll down to view my breakdown of Aether Current locations, which includes some information missing from the google Doc. All Quest-gained Aether Currents in this zone are obtained by following the Main Scenario. simply follow your MSQ line to fully unlock flying within this zone! Congratulations! You now have access to flying in all current zones that allow it! CROSS†CHANNEL, Doc Wagon, Jinzuku and 2 others like this.